AW18/19 trends, Dimensional Thinker, brings us a place to dream, a place to wander; a place to seek harmony and create refuge from the daily bombardment of the modern pace of life. It’s time to seek peace that lies within us that is echoed with the view of the star lit sky. With this it’s the Pantone colour “ultraviolet 18-3838” that is the colour of this season bringing inspiration from those said skies. The dark wonder of what lies ahead this season is for the dreamer, for the non-conformer, for the nomad to be free. Bringing no boundaries, no limits, no restrictions and no rules. This trend is all about the thought into what nature brings, the beauty of the raindrops on the spider's web against the harshness of man made elements. With the sky bringing a concept sci-fi feel, the stars echo fabrics of an metallic feel, think silver, think sequins, think sparkles. Lace has silver threaded through its design which translates to the skies structure which lends itself to line drawings with a geometric formation in prints and a complex feel in lace with a repeat pattern throughout the framework of the design. Alongside the delicate nature of the lace and fabrics sits the strong graphic view, where shapes are angular and jagged. Colour wise as well as the purple, yellows take on an Amber tone and Blues become energetic; think beach get aways where the softness and aged washed landscapes meet the stark look of the rocks on the beach. SS17 sees lingerie trends take a whimsical turn, think tulles, satins and embroideries. The softer colours of the hazelnut and pale dogwood, can be mixed with the stronger greens or brights or stay soft by themselves. There is almost a vintage feel to how the colours can be placed together. SS17 trends of Pale Dogwood meeting Pink Yarrow, the two pinks compliment each so well. SS17 colour trends, Pale Dogwood sits together with Niagara and Flame. Reflective Geometric trend is a strong trend, where patterns highly influence the meshes and laces of this trend. There is a modern air to this trend, greys and ice blues feature in this trend as well, but are paired with accents of gold and mustard. Autumn/Winter 16/17 trends are split into two main categories "Fade away to Nothing" and "Reflective Geometric". Fade away to nothing shows the stillness and beauty of this trend, soft greys with ice blues, mixed with tulles and soft meshes. There is an air of delicate playful softness in this natural trend, and a gentle structure. If you've been following How to become a Lingerie Designer on Instagram or Facebook, you will have seen the colour trend boards for SS16 pop up each day with a different colour. I think Trend boards are a great way to be inspired and to re-group your ideas on your designs. For those who missed the other four - here they are below. I looked at Pantone's top SS16 colours the other day and picked out my favourite top five, to beat away the cold weather that has descended. What surprised me was how much I loved the colour Lilac Grey (pantone 16-3905). My whole career has always been about the brights, in the studio when I designed for Topshop, I was always given the bright designs. When I had my label, the piece that sold out from my first collection was a black Liberty unicorn print on a red background with lime green bows. But looking at this lilac grey colour, I was captured by it's serenity, there is no screaming look at me, it is so understated that it is quite simply elegant and beautiful. Which got me thinking what other colours are out there that I have brushed off in the past, simply because they haven't caught my eye? (The other four colours will be shown next week). Love it or hate it; 2015 pantone colour of year goes to Marsala (or technical name: 18-1438). This earthy rich red wine colour strikes an elegant colour when used by itself or a sophisticated accent when paired with other colours. And with SS15 already here, the catwalks and shops have already filtered this colour (or similar hues) into their Lingerie brands. STRUCTURED CLARITY is stripped back to create a look that has a simplicity air surrounding it. The look is modern yet retains a retro feel. Graphics are pixelated and fabric is formed to shapes that defy gravity. There is a scientific fascination with this trend, a conformation of texture and structure play an important part. Fabric finds it's way to everlasting pleats and ruffles, the lingerie is manipulated and intricately constructed in a way that woven fabric echoes the effects of waves. RHETORICALLY RUSSIAN takes on the darker florals, they are presented in a dark masculine way, with the ferocious tones of burgundy mixed with hues of purple and reds running through them. The cold spell of Russia echoes the brutal yet partly delicate darker side of nature. Like Russian dolls floral patterns are repeated over and over. As well as florals, lace is used as the intricate pattern reminds us the ingenious reflection of the ice that surrounds the winter season. Have you ever thought where trends actually come from? I don't mean looking at catwalks or WGSN, I mean taking a step further back than that. Currently I am studying for my Masters in "International Fashion Management" and the first assignment is: FASHION TREND PREDICTION & PRODUCT DEVELOPMENT IN A GLOBAL ECONOMY, which basically means that you analyse the macroeconomic sector of the fashion industry. And usually where fashion goes lingerie follows or compliments it to a certain extent. So after spending ten weeks of looking at global trends for outerwear, I can bring you the translation to lingerie. Although trends interlink one another and there is no set one thing influencing trends, next season sees bright colours that compliment one another. There are four countries, Brazil, Russia, India and China (BRIC) in the economy; that are at a similar newly advanced economic stage. Due to their sustained economic development there will be further growth as these countries seek new opportunities beyond their home shore. Brazil will influence the trends of SS14 as next year the country, which has won bids to host both the 2014 World Cup and the 2016 Olympics, will have a further impact in boosting the countries economy and influence on the fashion trends. This is a trend that echoes the colours of a Brazilian carnival. Think bright, cold, playful colours, and although the colours are bold, the palette is complimentary. 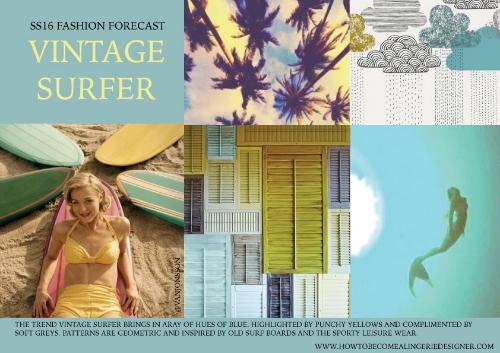 S/S’14 sees these playful palettes of bright zesty yellow sitting alongside china blues and flashes of pink.